Frequent visitors to Versailles and more have become familiar with Louise-Elisabeth Vigée-Lebrun, one of the most successful painters of her time and Marie-Antoinette’s favorite portraitist. Madame Lebrun left France as early as October 1789, after the royal family relocated, much against their wishes, to the Tuileries. She traveled extensively in search of new patrons, in Italy, Germany and Russia, where she found what she calls herself une seconde patrie, a second homeland. Vast and handsome though London may be, the city affords less food for the artist’s interest than Paris or the Italian towns. Not that you do not find a great number of rare works of art in England. But most of them are owned by wealthy private persons, whose country houses and provincial seats they adorn. At the period I mention, London had no picture gallery, that now existing being the result of legacies and gifts to the nation made within a few years. The streets of London are wide and clean. Broad side pavements make them very convenient for foot-passengers, and one is the more surprised to witness scenes upon them that ought to be proscribed by civilization. It is not rare to see boxers fighting and wounding each other to the point of drawing blood. Far from such a spectacle seeming to shock the people looking on, they give them glasses of gin to stimulate their zeal. Let’s keep in mind that, at the time, many streets in Paris are narrow and, outside the more fashionable districts, unpaved. There are no sidewalks, and Paris pedestrians are at the mercy of carts and carriages. Sunday in London is as dismal as the climate. Not a shop is open; there are no plays, nor balls, nor concerts. Universal silence reigns, and as on that day no one is allowed to work nor even to play music without incurring the risk of having his windows broken by the populace, there is no resource for killing time but the public walks. These, indeed, are very well frequented. “You enjoy yourselves with what would bore us,” I replied. I really did not see what pleasure was to be got out of stifling in such a crowd that you could not even reach your hostess. Nor are the walks in London any livelier. The women walk together on one side, all dressed in white; they are so taciturn, and so perfectly placid, that they might be taken for perambulating ghosts. The men hold aloof from them, and behave just as solemnly. I have sometimes come upon a couple, and have amused myself, if I happened to follow them awhile, by watching whether they would speak to each other. I never saw any who did. The most fashionable woman in London at this time was the Duchess of Devonshire. I had often heard of her beauty and her influence in politics, and when I called upon her she greeted me in the most affable style. She might then have been about forty-five years old. Her features were very regular, but I was not struck by her beauty. Her complexion was too high, and ill-fortune had ordained that one of her eyes should be blind. As at this period the hair was worn over the forehead, she concealed the eye under a bunch of curls, but that was insufficient to hide such a serious defect. The Duchess of Devonshire was of fair size, her degree of stoutness being exactly appropriate to her age, and her unconstrained manner became her exceedingly well. I also went to Lord Moira’s country seat. Although I have forgotten the name of his house, I remember how comfortable everything was and what wonderful cleanliness prevailed all over. 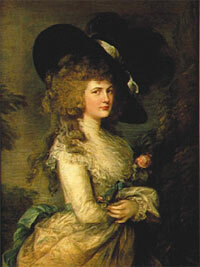 Lord Moira’s sister, Lady Charlotte, kind and courteous, did the honours with infinite tact. It was, therefore, unfortunate that the place was so boring. At dinner the women left the table before dessert; the men remained to drink and talk politics. I can truthfully state, however, that at no gathering I attended did the men get drunk. This convinces me that, if the custom once existed in England, it has now ceased as far as good society is concerned. Madame Lebrun refers here to the English custom that demanded that ladies retire to a drawing-room before dessert, leaving the dining-room to gentlemen. Horrified French travelers had reported witnessing unseemly behavior, such as drunkenness or the passing around of a chamber pot, by said gentlemen as soon as the ladies had left the room. It is a relief to hear that those excesses were not longer tolerated at the turn of the 19th century, though it seems a bit harsh to have deprived women of dessert on the basis of gender. The name of Lord Moira, by the way, is, or should be, familiar to Janeites. He played a prominent part in the bankruptcy of Henry Austen, Jane’s banker brother. And does the following not remind you of a similarly dull evening at Netherfield Park, in Pride and Prejudice? After dinner we met together in a large hall, where the women sat apart, occupied with embroidery or tapestry-work, and not uttering a sound. The men, on their side, took books to hand, and observed like silence. One evening I asked Lord Moira’s sister, since the moon was shining brightly, whether we might not go for a walk in the park. She replied that the shutters were closed and that caution demanded they should not be reopened, because the picture-gallery was on the ground floor. As the library contained collections of prints, my only resource was to seize upon these collections and go through them, abstaining, in obedience to the general example, from a single word of speech. In the midst of such a taciturn company, fancying myself alone one day, I happened to make an exclamation on coming to a beautiful print, which astonished all the rest to the last degree. It is, nevertheless, a fact that the total absence of conversation does not preclude the possibility of pleasant chat in England. I know a number of English who are extremely bright; I may even add that I never encountered one who was stupid. I often met them in the pouring rain, riding without umbrellas in open carriages. They are content with wrapping their cloaks about them, but this has its drawbacks for strangers unaccustomed to such a watery state of things. 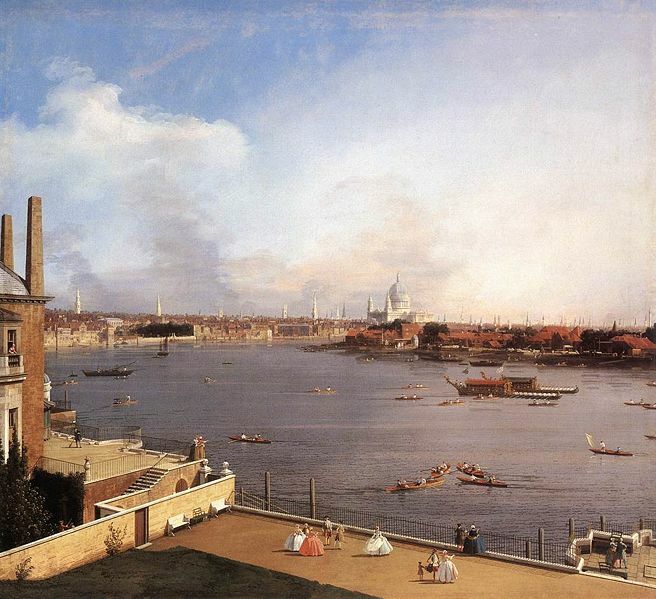 Though I had come to England with the intention of remaining but five or six months, I had now stayed nearly three years, held, not solely by my interests as a painter, but also by the kind treatment bestowed upon me. I have often heard it said that the English are lacking in hospitality, but I am far from sharing that opinion, and harbour grateful memories of the cordiality I met with in London.